Welcome to the Cactus Teachers Newsletter, a new monthly newsletter dedicated to our teachers to keep you up-to-date on everything at Cactus. Whether you are currently teaching a course or taking a break for the summer, we’ll be bringing you teaching tips, exclusive offers, news and inspiration – and welcome your comments, too! Meet the Cactus team who will be your main points of contact and provide full support while you are a teacher with Cactus. Our best tips for keeping students motivated and maintaining enthusiasm in the classroom, from our academic expert Fay Drewry. As a Cactus teacher you are entitled to a fantastic 50% discount off our evening language courses across the UK. Simply choose your course on www.languagecoursesuk.co.uk and call us on 01273 830 960 to claim your discount! Before each new term, we run free taster classes in select locations to enable potential students to sample a language lesson and chat to us about their plans. If you would like to run a taster class, let us know! If you are not already a member, please join the Cactus Teachers Facebook Group. This group has been created by Cactus to build a language teachers’ community where members can share interesting articles, news, events, photos and more. Currently over 300 members! From the autumn, Cactus will be offering evening language courses in 10 locations across London. New for October 2015 are Clapham and Fulham, and junior courses in Brighton. 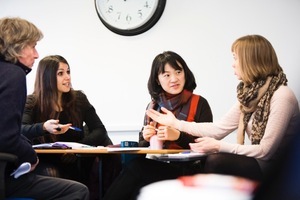 Our best ever offering of language courses in the UK! We hope you have enjoyed the first edition of the Cactus Teachers Newsletter. We welcome comments and suggestions for future newsletters, so please do contact us to share your thoughts. Cactus works with the best language teachers all over the world. With an extensive number of teachers delivering our private and group language courses Cactus provides in-house academic support for both our teachers and students through our academic and operations team. Dorotea holds a BA in French and Spanish from King’s College London and a MSc in International History from the London School of Economics. As a polygot of some distinction Dorotea is bilingual English-Italian, is fluent in Spanish and French, has advanced Catalan and is also learning Portuguese. Dorotea has worked and studied acrossed the world including North America, Italy, Spain, France and the UK. Heading up our operations team Dorotea likes to volunteer and fundraise in her free-time. Laura holds a BA in English Literature and History from the University of Aberystwyth and has worked at Cactus Language since 2013. Laura also holds the Cambridge CELTA and previously has been an English language teacher and consultant for an international private tutoring organisation. Laura speaks French, enjoys travelling in her free time, and has a particular interest in Italian gastronomy. Ana has a BA in Spanish Philology, Language and Literature from the Univerity of Valencia and speaks Spanish, Catalan and English fluently. She also speaks French, Italian and Japanese. Ana has worked as a Spanish language teacher and at Cactus looks after some of our key evening language course groups. Holding the CertTESOL, DELTA, MA and DipELTM qualifications, Fay looks after the academic health and integrity of our language courses. She is perfectly placed to do so with vast experience in the teaching industry, including 12 years as a teacher, 7 years as a teacher trainer, and having held positions such as Cambridge CELTA Assessor and Trinity College London Examiner. If you haven’t met the team in person yet, there will be plenty of opportunities in the future either during teacher observations, taster classes, end of course events and teachers get-togethers, all coming up in the near future. Language students tend to rely quite heavily on their teacher; looking to their teacher for all the answers, depending on the teacher to model the target language, believing that only the teacher can provide the solutions to their language learning problems. And teachers are often guilty of fostering a behaviour that encourages this perspective. However, there are plenty of ways to encourage students to see their peers as a good resource for new language and correct language, and to encourage them to listen to and rely on each other. Why is it important that students listen to each other? Surely students are better off ignoring their classmates whose language is full of errors, and just listen to the teacher who will model the language correctly? Get with the accent: It is very likely that whatever language someone is learning they will be speaking to other non-native speakers of this language in the ‘real world’. It is important to get used to a range of accents and to be able to ‘interpret’ the message that it being communicated, regardless of the first language of the speaker. Learn from mistakes: Students should be encouraged to identify and learn from each others’ mistakes. Rather than relying on the teacher to give the correct answer every time an error is produced, the teacher can encourage the students to correct each others’ mistakes. This can be via on-the-spot error correction, or by boarding errors and getting students to discuss corrections in pairs before feeding back to the class. Emerging Language: Students often use the classroom environment to ‘test out’ new expressions they have read or discovered outside of the classroom. This ‘emerging language’ can be a great resource for the teacher and for other students to learn from. Students can be encouraged to listen to each other to notice new and useful expressions/vocabulary. In open class feedback students can listen to count and note the number of new expressions that are used, for example. If you don’t know, ask: Students should be encouraged to ask questions about the language they are learning – not just to the teacher but to their classmates and other people they meet outside of the classroom. A language learner is never going to get very far by relying on only one source of information (the teacher) during their entire language learning journey. They should be asking questions and thinking about the meaning, form and function of the language as they advance and progress, wherever they are and whomever they are with. Building confidence: Peer teaching gives students the opportunity to clarify what they already know in their own minds. It is much more useful for the student to reinforce their own understanding of the target language by explaining to a peer, rather than listening to the teacher repeating something for them. It also engenders a ‘I actually know this stuff!’ feeling in the student, which is both motivating and rewarding. Even though teachers often secretly feel they should be ‘masters of their kingdom’ when they are in class, it is important to remember to constantly hand over to students. Look for new ways to make students independent learners both inside and outside of the classroom, to build their confidence, and to always facilitate, rather than dictate. As experts in the language education industry, Cactus has over 15 years’ experience designing and implementing language courses. If you have a language learning or language teaching query that you can’t find the answer to, please get in contact with us either by Facebook or by Twitter or contact us here. In line with our new teacher training courses for foreign languages, we’re bringing you our best tips for how to make your language classes engaging. Whatever your lesson aims, find out what your students already know about the target language/topic. This shows you, the teacher, the language your students already have, encourages revision and recycling, and is good opportunity for some peer teaching and peer correction. It also shows your students what they lack, and shows them the language they don’t have, thereby creating a need for that language, which in turn motivates them to participate in the activities that follow – “I don’t know how to say this, I need to pay attention here!”. Activating schemata benefits both the teacher and the students on many levels. Images, realia, discussion questions, what happens next and problem-solving questions are some ways of activating schemata. Generally people prefer to talk about themselves, or about what they know. Remember – if someone doesn’t have a lot to say about a topic in their own language, they will have even less to say in a foreign language. By personalising your activities and finding a way for your learners to relate the questions to themselves, their lives, their experiences and their opinions, you will find that they have a lot more to say, and will be much more engaged. Increasing student talking time and reducing teacher talking time is key to maintaining students’ engagement levels and ensuring they progress at a good speed. However, it’s also important to remember to change things up – people don’t want to be working with or talking to the same person all the time. So change the pairs around, do the activities in groups of 3 or 4, change the classroom set up and physical arrangement. Keep things interesting by not being predictable. People learn in different ways so it is important to cover all bases by including a variety of activities that cater for different learner styles. Remember to have a good balance between aural, visual and kinesthetic tasks – this will keep your students engaged and also ensure that their learner style needs are being met. If you’re in a classroom that cannot accommodate a running dictation then get students to the board for feedback – you can incorporate ‘catering for different learner styles’ at all stages of the task cycle. Don’t use materials or activities you find boring, tedious or pointless. If you don’t like the materials or activities then this will show, and your students will not like them either. Be interested in what you are teaching and who you are teaching, and your students will be interested in what is being taught. Sometimes it is difficult to maintain enthusiasm for topics or language points you have taught many times before – so find different materials to teach the target language. Use authentic materials, take information from the internet, video clips, music, YouTube, TED talks etc. Bring the outside world into the classroom and your students will relate and participate fully. 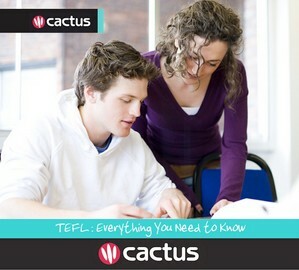 Cactus has a wealth of information and tips on language teaching. Visit our blog or sign up to our newsletter for further information about language learning and teaching. Of course, you can always call us on 00 44 (0) 1273 830 960 for information and advice on anything related to languages.